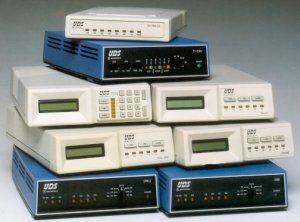 D19.2-This model transmits synchronous or asynchronous data at "native" DDS rates of 19200, 9600, 4800 or 2400 bps. It responds to DDS diagnostic tests generated by the telephone company, and also features internally controlled tests. It will operate as a limited distance modem from 4.5 to 28 miles, depending on wire size and data rate. D56-This DSU/CSU permits 56 kbps communication in either point-to-point or multipoint networks. An optional adapter cable provides a CCITT V.35 interface for connection to business equipment. The D56 may also be mounted in the Universal Data Shelf multi-modem enclosure. DDS/MR1- This device, which is compliant with AT&T publications 41450 and 62310, provides a choice of data rates (64, 56, 19.2, 9.6, 4.8, 2.4 or 1.2 kbps) and interfaces (EIA232, V.35, EIA-449 or EIA-530). A version is also available that provides a 19.2 kbps DTE rate while using a 56 kbps DDS service. The DDS/MR1 is fully compatible with UDS models D19.2 and D56 units as well as other Bell 500A and 500B units.T1-CSU - This CSU links the user's T1 digital terminating equipment with a T1 network. Includes line equalization and three types of network "keep alive" signaling. One type of "keep alive" signaling included is zero suppression by bipolar substitution (B8ZS) allowing the transmission of data with long strings of zeros while maintaining a sufficient ones density. DTE, network and end-to-end loopback test capabilities are also included. DU100 - This data unit accesses the switched digital service provided by the Northern Telecom@ DMS®-100 family of central office switches or with a Northern Telecom Datapath extension module in a D4 channel bank. It provides a choice of EIA or CCITT interfaces and speeds from 300 bps to 64 kbps. AT command and Northern Telecom symbolic keyboard dialing are supported. The unit permits inter-working with Accunet Switched 56 at a data rate of 56 kbps and with ISDN at multiple rates. It is available in an LCD standalone package or configured for Universal Data Shelf mounting. DU100 LS - This unit is a small, desktop sized, standalone unit. It provides the interface between the telephone company's DMS-100 based switched digital data service (Datapath) and the customer's data terminal unit. It will interface with a Northern Telecom DMS type central office switch, an SL-10 or with a Northern Telecom Datapath extension module in a D4 channel bank. It transmits full duplex, asynchronous data at 300 bps to 19.2 kbps when used on intra-switch calls or over a T1 link. The unit provides AT command set compatibility and supports Northern Telecom symbolic keyboard dial. TA120 - This ISDN terminal adapter provides voice and data communications over ISDN basic rate lines. This model interfaces with the user's personal computer or other data terminal equipment, and also interfaces with traditional telephone sets to permit simultaneous voice and data transmission over a 2-wire RJ45 connection in conjunction with an NT1 device. It provides two 64 kbps "B" channels and one 16 kbps "D" channel. It transmits 300 to 19200 bps asynchronous data and 1200 to 64000 bps synchronous data. Compatible with Northern Telecom DMS-100 and AT&T 5ESS® central office switches, its liquid crystal display packaging provides 32-character display and 3-button programming of all options from the front-panel. The TA120 supports AT command set auto dial. Also supports front panel dialing of stored numbers and DTR dialing. It is available with an optional numeric keypad.